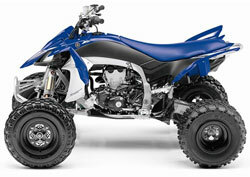 The Yamaha ATV Guide is here to keep you up to date on all the Yamaha all terrain vehicles. We'll cover the latest models including the Rhino, and many of the most popular Yamahas from the past few years. The older Banshee, Blaster, Raptor, and Warrior models are still around in big numbers for the sport ATV crowd. And the Wolverine brings sport to 4 wheel drive. But we're not forgetting about those Yamaha utility bears either - the Grizzly, Kodiak, Big Bear, and Bruin. 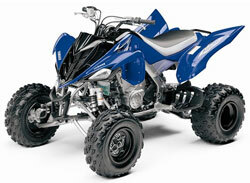 You'll find reviews, videos, pictures, and anything else we can get our hands on about these Yamaha ATVs. Yamaha has a full line of utility models. That means we'll be updating this page often - so check back to see what's been added! If there's something you would like to see - give us a shout out on our Contact Us page. The Big Bear puts a premium on simplicity and reliability in a mid-size model. An air cooled engine with a 5-speed automatic clutch transmission keeps maintenance to a minimum. But the 4 wheel independent suspension and 4wd along with the excellent Yamaha variable lock front differential give you plenty to work with. The Grizzly model line extends from the entry level 125 all the way to the fully loaded 700. In the middle are the value priced 350 with 4wd. Next up is the 450 which now offers a model with electric power steering. The next level has the 550 with fuel injection, 4wd, 4 wheel independent suspension, full size chassis, and disc brakes on all four wheels. There's a model with EPS too. The top model has all the features of the 550 with the big bore power of a 700cc liquid cooled, fuel injected engine. 2019 Grizzly EPS and new EPS SE Quick Guide - Yamaha is only offering these two models for 2019. Our guide includes prices, photos, specs, and all key features. 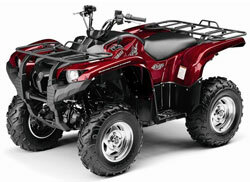 Grizzly ATV Guide - All the Yamaha Grizzly models are covered from 125 to 700. Details of each Grizzly model along with photos and complete specifications. 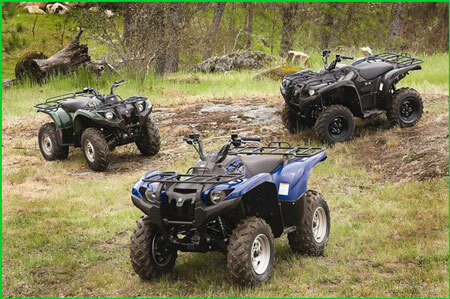 Recommendations for which of these Yamaha ATV models is best for your riding style. Grizzly 700 Review - Full review of the 700 complete with video, photos, and specs. Guide to Yamaha Grizzly Accessories - Find out which accessories were the most popular with Grizzly owners. Details the accessories owners felt improved their ATVs the most. Includes links to the best deals with daily updates. 2019 Kodiak 450 Quick Guide - Easy to use guide to the mid size Kodiak models. Prices, photos, specs, videos, and key features. 2019 Kodiak 700 Quick Guide - This guide covers the larger 700 Kodiak models with details about the new for 2019 engine. There's a Raptor model that will fit almost anyone. Starting with a 90 for the kids, a 125 for tweens, the 250 and 250R for entry level adults, the 350 for more punch, and the 700R and SE with a liquid cooled and fuel injected engine for all kinds of insanity! 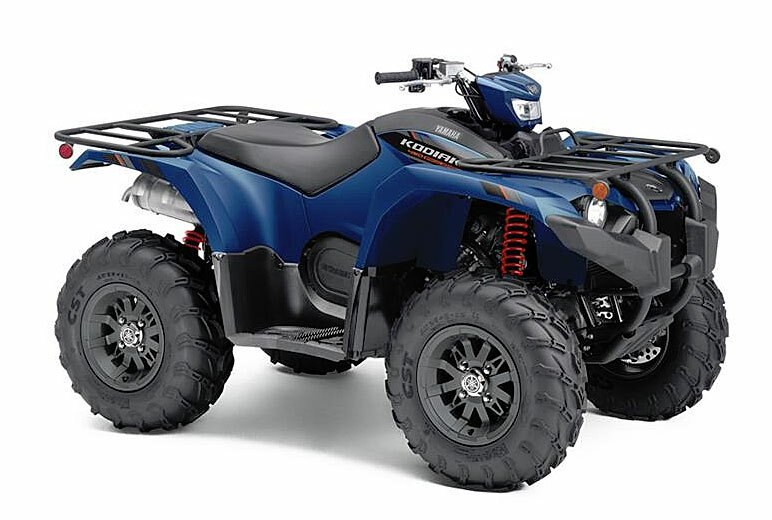 The YFZR is the full tilt boogie racer of the Yamaha ATV family. We won't try to list the long line of features here. Let's just say it comes with everything you need to go from the showroom to the track. The YFZX version is tweaked for cross country woods racing. It also is ready to go without buying anything extra for racing between the trees. 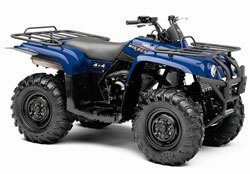 The 450 Wolverine is for riders that need 4wd but want something sportier than the normal utility models. Just look at it as part Grizzly and the other part Raptor with a little YFZ for spice. Yamaha ATV Battery - When it's time to replace your ATV battery there are a few things you'll need to know. Find out what they are and where to get the best deals on ATV batteries. 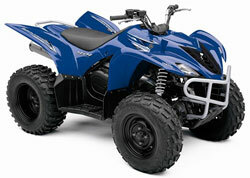 Used Yamaha ATV Parts - Finding the used Yamaha parts you need could stress out Gandhi. Why not go straight to the biggest market online? We've already done the hard part for you and searched for all the deals on used parts for Yamaha 4 Wheelers. Be sure to check out our list of bargains. Yamaha Side by Side Guide - Latest coverage of Wolverine, Viking, and YXZ models. Includes coverage of older Rhino models.